K. A. Müller´s interest in phase transition of SrTiO3 ST, Bednorz´ master thesis on Verneuil growth of ST, and that reproducible physical measurements require „sufficient characterization“ as defined below. H. J. Scheel, J.G. 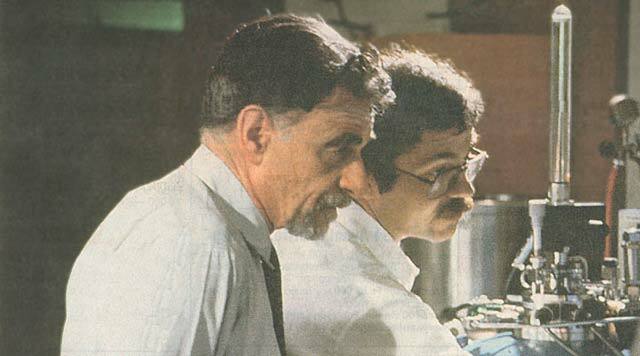 Bednorz, and P. Dill : “Crystal Growth of Strontium Titanate SrTiO3”, invited, Third European Meeting on Ferroelectricity EMF-3, Zürich, Switzerland, September 22-26, 1975, Ferroelectrics 13 (1976) Nos. 1-4, p. 507-509. 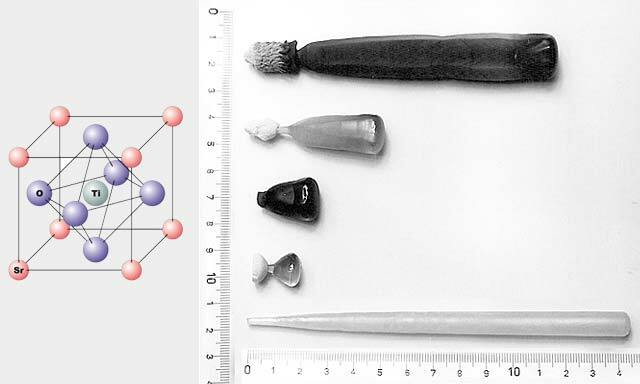 J. G. Bednorz and H. J. Scheel : “Flame-Fusion Growth of SrTiO3”, J. Crystal Growth 41 (1977) No 1, p. 5-12. H. J. Scheel : “Kristallzüchtung und Charakterisierung von Strontiumtitanat SrTiO3”, Zeitschrift für Kristallographie 143 (1976) p.417-428. B. I. Halperin and C. M. Varma: “Defects and the central peak near structural phase transitions”, Physical Review B 14(1976) p. 4030–4044. J.O. Fossum, K. Fossheim, and H.J. Scheel : “Ultrasonic Investigation of the Phase Transition in Flux-Grown SrTiO3”, Solid State Commun. 51 (1984) p. 839-844. A. Okazaki, N. Ohama, B. T. M. Willis, Y. lwata, K. A. Müller, and H. J. Scheel : “Time-Dependant Strains near the 105 K Transition in SrTiO3” Phase Transitions 3 (1983) p. 339-349. H.J. Scheel: “The development of crystal growth technology” in “Crystal Growth Technology”, editors H.J. Scheel and T. Fukuda, John Wiley & Sons Chichester U.K. 2003 and 2004, p.3-14. Definition of „Sufficient Characterization“ (S.C.): It is the analysis of all those structural and chemical aspects (defects) of the sample that have or may have an influence on the specific physical measurement, because all crystals are different with respect to defects, impurities and inhomogeneities. Without S.C. physical measurements are not reproducible.